My first flea market day at the Somerville Flea is two weeks away! I can’t wait! My apartment is bursting with flips…mostly finished but several pieces waiting their turn. I have no room to work on them! My “real” job has been keeping me VERY busy the last few months so I’m really glad I was able to get ahead and have so many pieces ready to go. So here are a few of the latest! Someone sent me this suggestion/idea last year. It took me a while to finally find a suitable table, but I did! 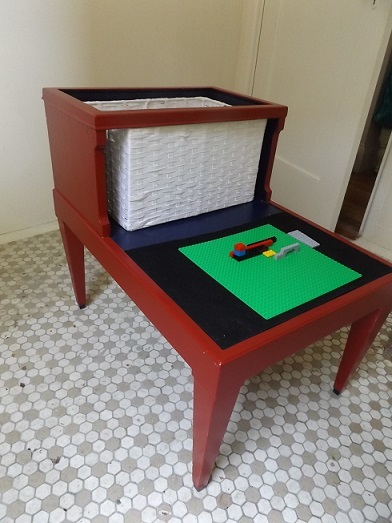 It’s a great place for playing with LEGO’S and for storing them! Easy -peasy clean up!! Just toss them all in the basket. 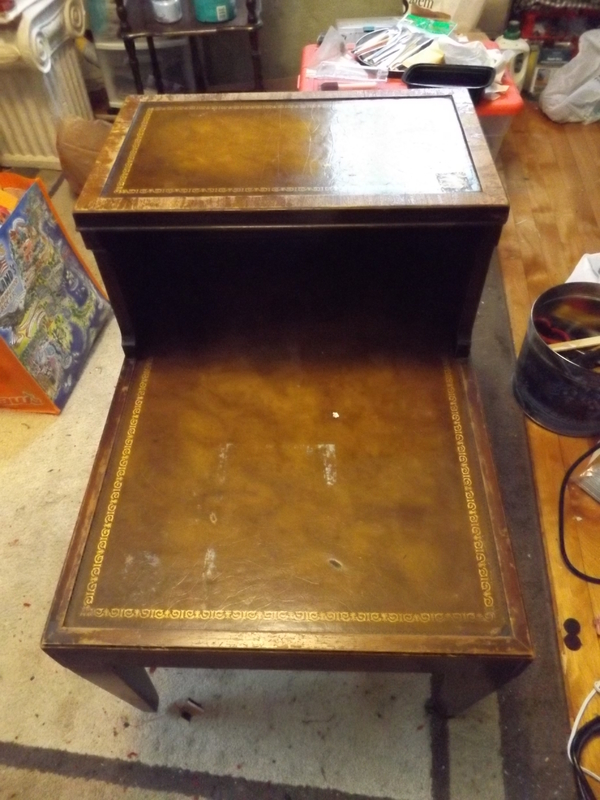 The next before and after is a great little table…in my humble opinion. okay, so I don’t know what that weird black squiggle is on the AFTER photo, but I assure you, it’s not there in person! 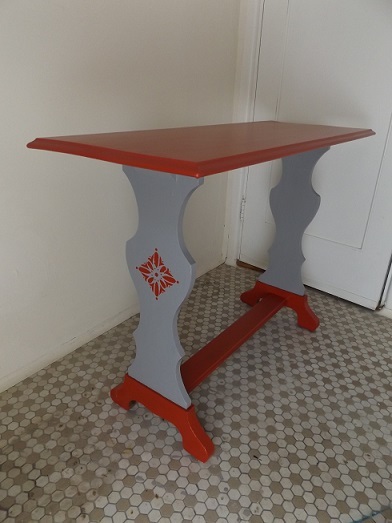 I really wish I could find the before picture of this table. It was nothing exceptional, nor was it in horrific condition. It was just a plain piece of brown furniture. Now it has some personality! Speaking of brown furniture. I have a friend Ron, who I met when he taught me how to re-cane chairs. He HATES painted furniture!! I get it. I have a degree in the history of decorative arts, and although furniture was not my interest or focus of study (ironic, I know) I DO have a great respect for the natural beauty of a piece of wood. I love the beauty of the grain and the finish of unpainted furniture. I know that in the antiques and auction world a piece of furniture in it’s natural state is always much more valuable than a piece that’s been altered in ANY way. But I’m not working on museum pieces. I wouldn’t consider painting a piece that I have if the wood is good and is still beautiful. If I can clean it up, maybe restain I’m happy to do so. But the fact is the pieces I work on are the ugly, beat-up, discarded, mess of a remnant of a once nice piece. 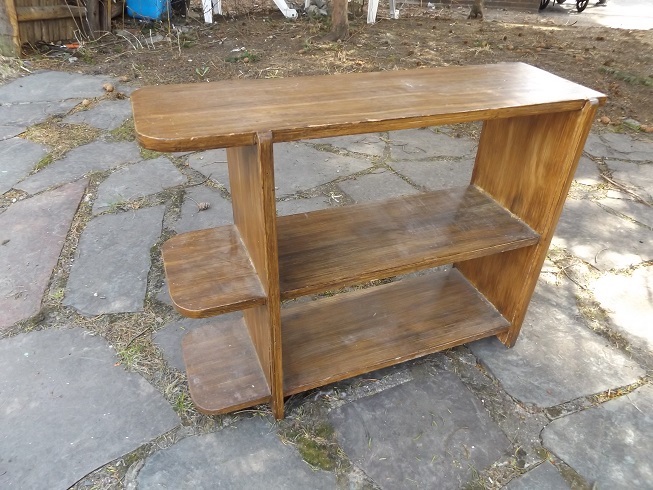 So I can leave it on the side of the road or in a thrift shop, ugly and unloved, and probably headed to the dump, or I revive it and make it wanted and desired again. 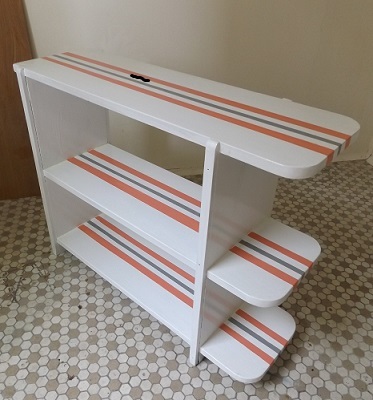 The fact is, these days most people don’t go for what we call “Brown Furniture.” So I paint. Or decoupage. Or both.